The above Style 2 Sportsman was introduced for the Spring of 1959 and was illustrated by Ilford advertisements in 'Colour Photography' magazine Vol 2, Vol 3 and Vol 4 (of 6). "If you are looking for a 35mm camera at a reasonable price to do your colour shots justice, the ILFORD Sportsman is marvellous value." 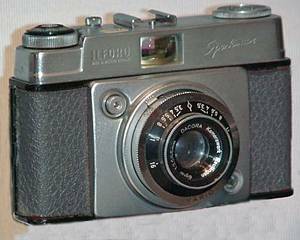 "If you are in need of a 35mm camera for colour, the ILFORD Sportsman is unbeatable value. It gives you all you need at a very modest price." The exact Dacora equivalent also exists. 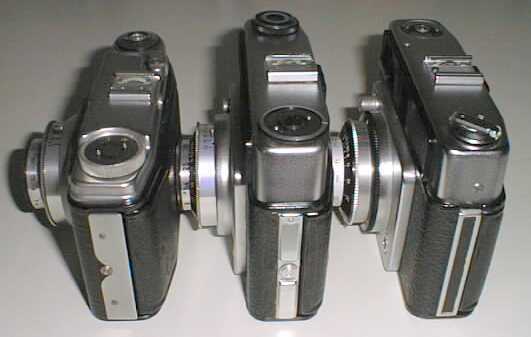 A significant styling change from the 1957 version is that the 'Ilford' and 'Sportsman' markings have been removed from the black leatherette, bottom left and upper right (as the original Dacora Dignette) and have been embossed into the bright finished front of the top cap, either side of the viewfinder. The original markings were susceptible to fading, due to them being beneath where one grips the camera front, and presumably some minor cost saving was achieved by simply incorporating them into the fabrication of the top cap, especially since the size of the top cap had increased to accomodate the new design of viewfinder. The lens is still a f3.5 Dignar in a 1/200th Vario shutter. 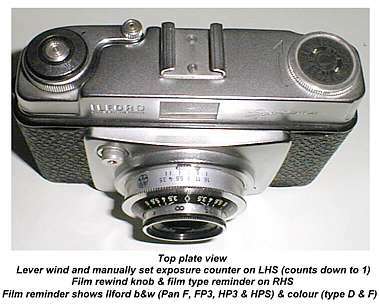 The Ilford advertisement claimed "Large eye-level viewfinder with luminous guide lines, press-button release, interlocking film-wind and shutter setting to prevent double exposure." The original instruction booklet can be viewed as a pdf file by clicking the picture. 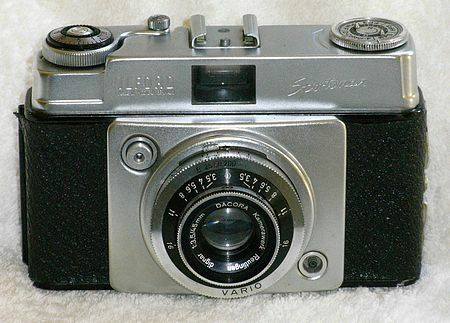 This Style 2 Sportsman, with Vario shutter and f3.5 Dignar lens, has a grey leatherette covering, as marketed in Europe, but not in the UK. Ilford felt the UK market required the more conservative black finish. The depth of the top cap has been increased to accommodate the new viewfinder with 'luminous guide lines' (the term which was subsequently coined and applied to this type of viewfinder was 'Bright-Line') and a larger rectangular opening for the user's eye. There are also parallax indication marks to give the user a better guide to the actual picture frame when taking close-ups. The picture above compares the original 1957 Sportsman with this later Style 2. Note the enlarged rear eyepiece but also the additional height of the camera introduced to accomodate the new design of viewfinder. Apparently people traded in the earlier design of camera just to get this new feature, even though they lost out heavily (financially) on the exchange. In Vol 2 of Colour Photography the price is given as £11.18s.5d = £11.92p case £2.2s.5d = £2.12p, but by Vol 3 (mid-1959) the price is quoted as £11.11s.11d = £11.60p, with the leather ever ready case an additional £2.1s.3d = £2.06p. An intriguing article on the use of the Style 2 Sportsman for capturing close up dental records was contained in an 'X-Ray Focus' magazine for June 1959. The back door opening mechanism was improved on the Style 2, as alongside. Between the first Sportsman in 1957 and the second in Spring 1959, the back release catch changed from the awful press-button 'nail breaker' on the LHS to the much improved sliding button catch shown in the centre. All that can be said for the original arrangement is that it would be difficult to open the back by accident, as its difficult enough by intention! The small button at the centre of the 'V' has to be depressed quite firmly. The revised version, while much easier, is perhaps a little too easy. By 1963 the back release had become a rather more conventional arrangement, involving using the thumb nail to lift up the latch at the top of the side release.